Box shaped like a Heart Lock. 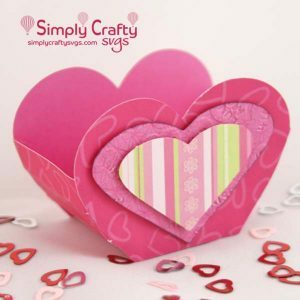 Here is a fun little Valentine’s box design with the Heart Lock Box SVG file. This 3D heart padlock is a perfect size box to hold a little Valentine’s gift or goodies. Your recipient would just have to peek through the little keyhole to see them before opening! This is also a great box for a wedding or anniversary. File comes with box, the lock bar, keyhole lock and key, and panels. Word sentiment is NOT included. Box, not including the lock bar, measures @ 4.6″ x 4.5″ and box is @ 2″ deep. Distress or Ink metallic paper to get an aged effect of key, keyhole and lock bar.